In 1976, one Lili-Marlene Premilovich clipped her moniker to the more mainstream Lene Lovich and cut a Christmas single, a version of "I Saw Mommy Kissing Santa Claus". While the world hardly needed yet another festive favourite thrust upon it, Lovich's yelping rendition set the tone for her future and then-prolific Stiff Records signed her up for what was to be a brief but lucrative period in her career. Fast forward to 1978 and a memorable Top of the Pops on which Lene Lovich did her best 'Kate Bush on acid' impression and delivered "Lucky Number". For its time, the single was an odd but naggingly-catchy ditty that bridged a gap between major-label radio-pop and the import of American new-wave singers flooding the late-evening airwaves. In many ways, it was a brave signing for Stiff, a move that was to reap them a #3 hit. Not bad for a song that was originally chosen to appear on the flip-side of a certain song called "I Think We're Alone Now". Luckily for "Lucky Number", it was flipped and became a hit. The former song, already a cover, launched twee '80s starlet Tiffany some years later - in a way, it's followed Lovich around as a consequence. Lovich's stage persona was of a wide-eyed pig-tailed whirlwind, dressed in wedding-dress white and proffering a musical fashion-hybrid of goth, Kate Bush, Shirley Manson and Toni Halliday. She notched up a few more minor hits in "Say When" and the Thomas Dolby-penned "New Toy", before leaving the music biz to raise a family. 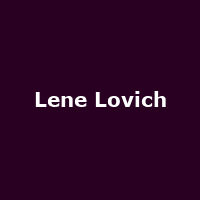 Fast forward to 2013 and LeneLovich is all set to take her previously idolised canon back on the road for a brace of spring shows. Her UK tour starts in Leicester on 17th February, with support from Kevin Hewick, before heading to the likes of Brighton, Leeds, Manchester, Exeter, London etc until Glasgow on 20th April. Support varies. Most of the shows are on sale now with tickets priced at around £15.